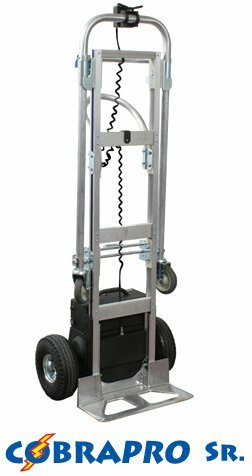 High-torque battery powered drive system makes easy work of hauling heavy loads over long distances. Powerful enough to climb standard truck ramps. Infinitely variable throttle handles every application and provides controlled descent. Easy fingertip speed control. Drive may be disengaged to use truck in manual mode. Power drive works in 2-wheel or 4-wheel mode. Complete with charger and rechargeable battery module. Spare battery modules are available for high usage and extended times between recharge. 10" full pneumatic tires for use on a variety of smooth or rough terrains. Reduces operator strain and fatigue and increases productivity. Battery module plugs directly into drive unit. No need to attach cables.